In Part 1, I was explaining why one should not attempt to save money at all costs for the purposes of saving money. The consequences of doing so could be too adverse and certainly highly embarrassing, especially if the document you are trying to produce on a low cost option is meant to go public. Sometimes, people do not want to spend money at all on translations and attempt to do it themselves, either because they feel confident enough in the target language or because they trust the many free translation softwares available on the net. If your target language is your mother tongue, you have excellent writing skills in your native language and if you master the subject matter well, chances are that you will produce an excellent translation. In this case, please read this section no further, this section is not for you. If on the other hand – and I suspect this is the case for most people – you lack any of these three elements (native language, writing skills, subject matter), then, . In my career of over twenty years as a translator, I have seen texts in French that were obviously written by English native speakers. I can say so because the French sounds jarring, unnatural and very often literal. Here is an example : “Le Centre des opérations de sécurité de T. est proactive en revue les dispositifs de sécurité gérés pour les vulnérabilités du logiciel“. This sentence was the French translation of a brochure whose English read: “The T. Security Operations Centre is proactively reviewing managed security devices for the software’s vulnerabilities” . If you are a native francophone reading this, you will be no doubt scratching your head: Was this translated by a software? If not, was this done by an anglophone? And if it was translated by a francophone, did the person only understand what he or she was translating? To conclude the matter on a funny note, here are some extreme products of “do it yourself translations” that I remember. 1) A hotel in Zurich posted a note next to its check-out counter reading “To expedite the check-out process, clients will be executed in strict order”. 2) In a commending effort to cater to the English-speaking community, a dry-cleaning business in Beijing displayed a poster on its front window which read: “Drop your trousers here”. This entry was posted in Translation Service and tagged professional translations, translation mistakes on May 29, 2014 by admin. b) Thinking that you know when in reality you don’t. I shall in this first blog address the first point and reserve the other two categories for later blogs. Save save save…. It is hardly surprising that, in the culture of mass consumerism in which we live, that the word SAVE is pasted over advertisements that bombard us every day and that the notion of saving while shopping has become ingrained in the deepest fibers of the consumer. When picking up the phone, the first question I am often asked is how much it costs. Starting a negotiation with the dollar figure puts me at most unease, for it puts me under pressure to lower my cost well below what I think is safe to produce a translation which meets our high standards of quality. Plus, forget about making a profit… and if one does not make a profit, what is the point of being in business? If, on the other hand, if I insist on a fee that nearly guarantees a high standard of quality, somebody may undercut me, which means that I stand to lose the client and incur the wrath of my wife for having been too inflexible. While I can understand the saving instinct of a caller wishing to have his daughter’s birth certificate translated, the cost factor as sole discriminating criteria used by large corporations in picking a translation service is more incomprehensible to me. Sure, corporations are controlled by shareholders expecting a good return on their investment, hence putting pressure on management to control costs. But those same shareholders expect their corporations to strive on the revenue side, which more often than not means conquering foreign markets and translating their external and internal documents correspondingly. A client buying a washing machine from company X is as much deserving of respect as a local client. Attempting to save beyond reason in your communication with that foreign client, seeing the cost of translation as a necessary evil shows a total lack of respect not just for that foreign client, but also for the exporting corporation itself and for it is attempting to achieve. Attaining the lowest costs for translations, if you are a large company, potentially leads to embarrassing translation mistakes that are most costly to fix than the saving that were originally achieved. This entry was posted in Translation Service and tagged quality, translation services, translations on May 28, 2014 by admin. How Do I Know That I am Getting a Good Translation From You? I was interpreting simultaneously into French two weeks ago with a colleague in Rouyn-Noranda using our portable equipment system. Rouyn-Noranda is a quaint mining town located in the North-West area of Quebec, not far from the Ontario border. This conference, organized by RUIS McGill (Réseau Universitaire Intégré de Santé) was devoted to Tele-Health. A very promising concept indeed, especially for health care in remote areas. Medical specialists are far and few in between in distant rural areas. You would in a typical town of 5000 find one or two family doctors, a few nurses, but hardly a cardiologist or an oncologist. The patient would have to travel to a large city to see a specialist. This requires time, money, organization and a considerable effort for the patient if his or her mobility is restricted. Tele-Health puts the patient in direct contact with the specialist and in real time through Internet technology and special software. It is a consultation done remotely. It makes the specialist more accessible to the patient, allows for faster care while reducing costs. During lunch, I was seated next to a friendly lady whose name was Deborah. Professor at McGill, she was explaining to me that her department had tasked a translation bureau with the translation into French of a large manual. The translation was deemed so poor that the department undertook to edit it to such an extent that the edited document was more a retranslation than a simple editing. Deborah even suspected the translation bureau used one of these translation softwares that one easily finds on the net when it provided the service. And of course, the department paid. So, she asked me how she could be sure that her next translation would be a good one. After having apologised for a substandard product delivered by an industry member (not the first time!) I told her how we sometimes do things for large job: I would select a few resumes from translators whom I deem are suitable to the task and who have successfully worked for us in the past. For privacy reasons, I cover their names, addresses and only identify them on their resumes as Translator A, Translator B etc…I e-mail those to the client for discussion and then discuss with the client the qualifications of the translators. Deborah thought it was a cool idea…and took my business card. This entry was posted in Translation Service and tagged great quality translations, judging translations, the problem with translation softwares on May 26, 2014 by admin. Express International Translations Inc. attended Naturallia that took place in Sault Ste. Marie from October 28 to October 30, 2013. Represented by both Philippe Vitu (President) and Dora D’Uva (Director of Marketing and Business Development) for its first participation at this event which gathers international stakeholders in mining, forestry and smart energy, Express International Translations Inc. made valuable international contacts through a business to business match-making process which will result in valuable translation contracts with entities as far away as Chile. 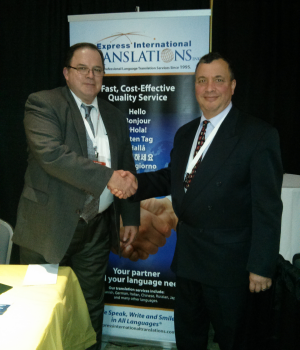 Philippe Vitu, President of Express International Translations Inc. and Mark Massicotte of L’Anse Manufacturing Inc. at our booth during Naturallia 2013 at Sault Ste. Marie. 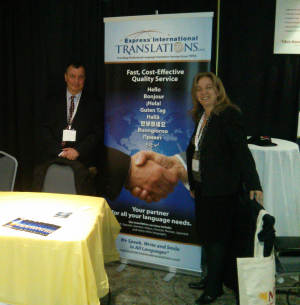 Philippe Vitu, President of Express International Translations Inc. and Dora D’Uva, Director of marketing and Business Development at our booth during Naturallia 2013 at Sault Ste. Marie. This entry was posted in Translation Service on May 25, 2014 by admin. 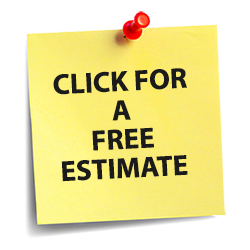 Get A Free Translation Estimate Today! If you have a need for any translation services, feel free to submit for a free estimate. This entry was posted in Translation Service on May 23, 2014 by admin.